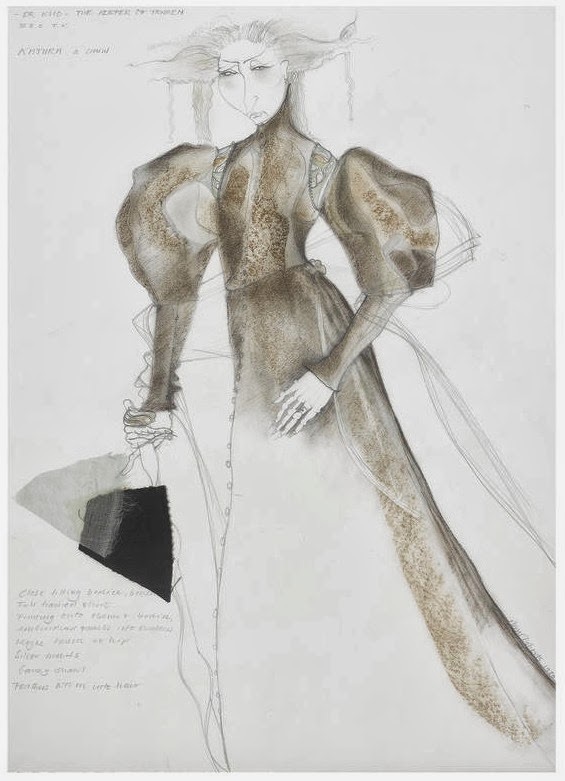 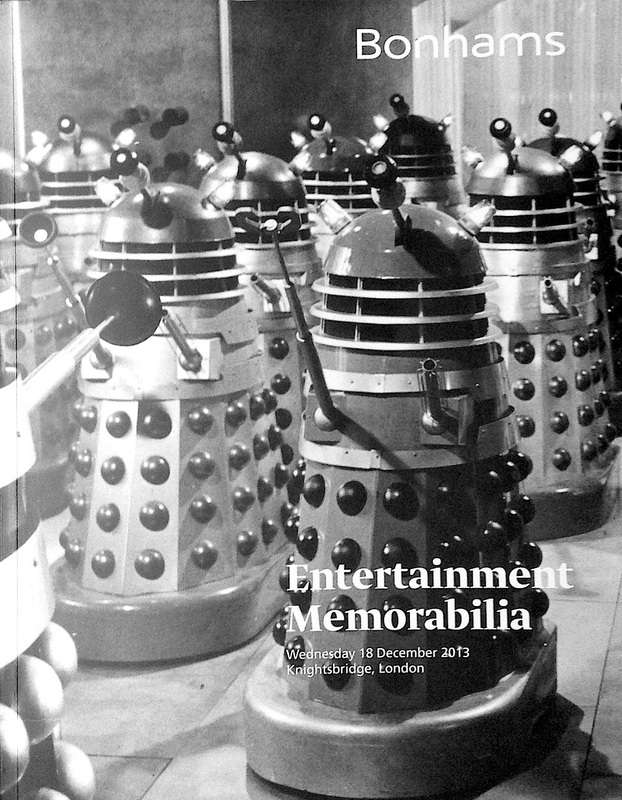 With December looming, it is time for another Bonhams Entertainment Memorabilia sale! 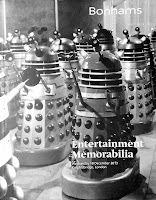 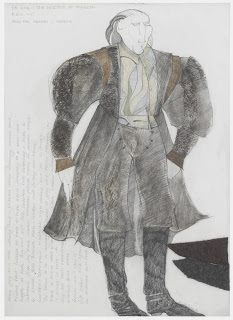 The past few auctions have been Doctor Who lite when it comes to items, so there is no surprise that the first post-Anniversary is brimming with costumes and nick backs, dating back to 1968. 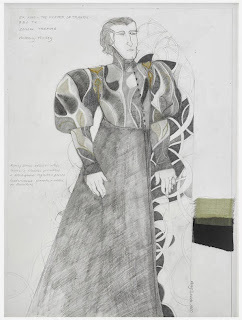 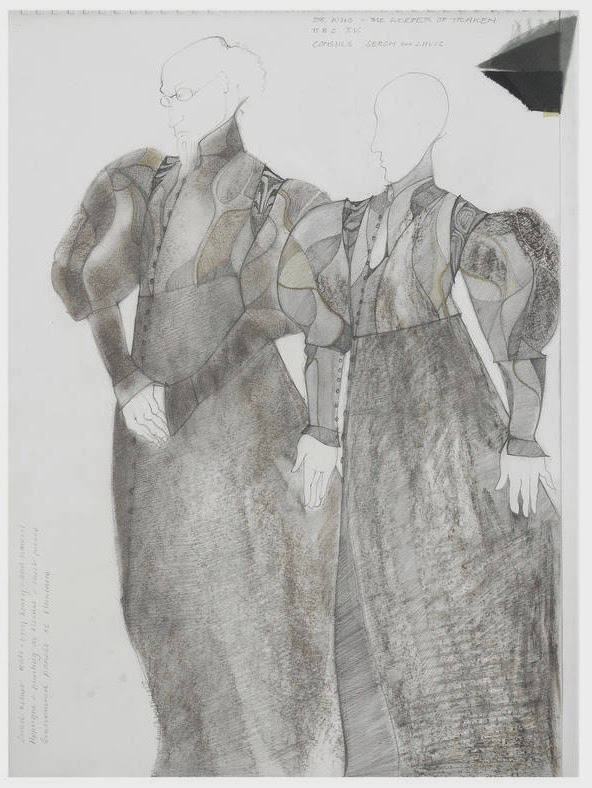 Olivier nominated costume designer Amy Roberts (born 1949) worked on a number of Doctor Who episodes including the Mawdryn Undead, Time Flight and State of Decay series. 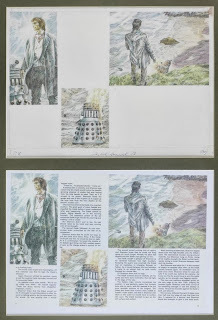 DOCTOR WHO: A PIECE OF ORIGINAL ARTWORK FOR 'THE DOCTOR WHO ANNUAL 1980', by Paul Crompton, ink and watercolour, mounted and framed with a copy of the printed art, for the story 'Reluctant Warriors', p.37, together with an original edition of the Annual, artwork 7 x 10 inches (18x25.5cm) within mount. 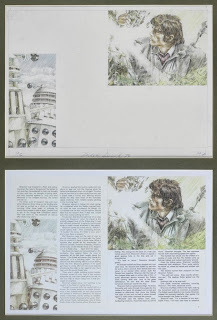 DOCTOR WHO: A PIECE OF ORIGINAL ARTWORK FOR 'THE DOCTOR WHO ANNUAL 1980', by Paul Crompton, ink and gouache, mounted and framed with a printed copy of the artwork, for the story of 'Reluctant Warriors', p. 36, together with an original edition of the Annual, artwork 7 x 10 inches (18x25.5cm) within mount. 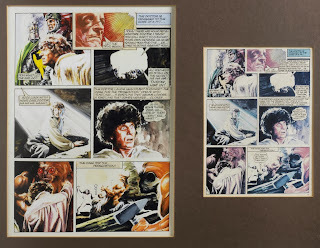 DOCTOR WHO: A PIECE OF ORIGINAL ARTWORK FOR 'THE DR. WHO ANNUAL 1979', by Paul Crompton, mixed media on board, for the story of 'The Power', p. 35, mounted and framed with a copy of the printed artwork and an original edition of the Annual, artwork 11 x 15¼ inches (28x38.5cm). 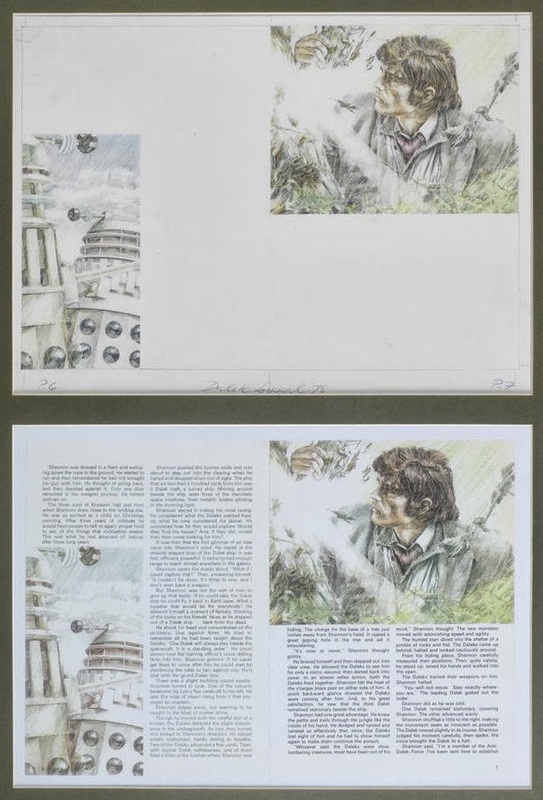 DOCTOR WHO: A PIECE OF ORIGINAL ARTWORK FOR 'THE DALEK ANNUAL 1978', graphite and coloured pencils on board, mounted and framed with a copy of the printed art, for the story 'The Castaway', pps. 8/9, together with an original edition of the Annual, artwork 11½ x 16 inches (29x40.5cm) within mount. DOCTOR WHO: A PIECE OF ORIGINAL ARTWORK OF DAVROS FOR 'THE DALEK ANNUAL 1978', gouache, for p.16, 'Davros Genuius Or Madman', mounted and framed, together with an original edition of the Annual, artwork 7¼ x 10 inches (18.5x25.5cm) within mount. 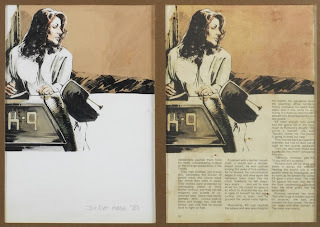 artwork 12 x 16 inches (30 x 40.5cm) within mount. 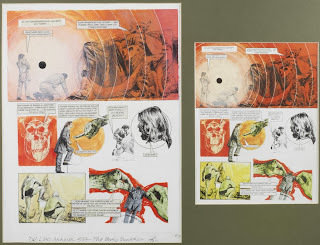 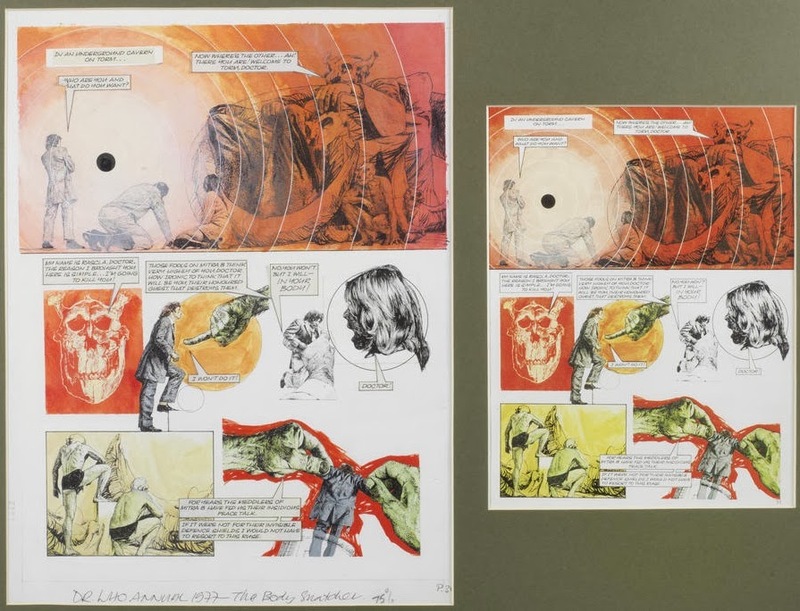 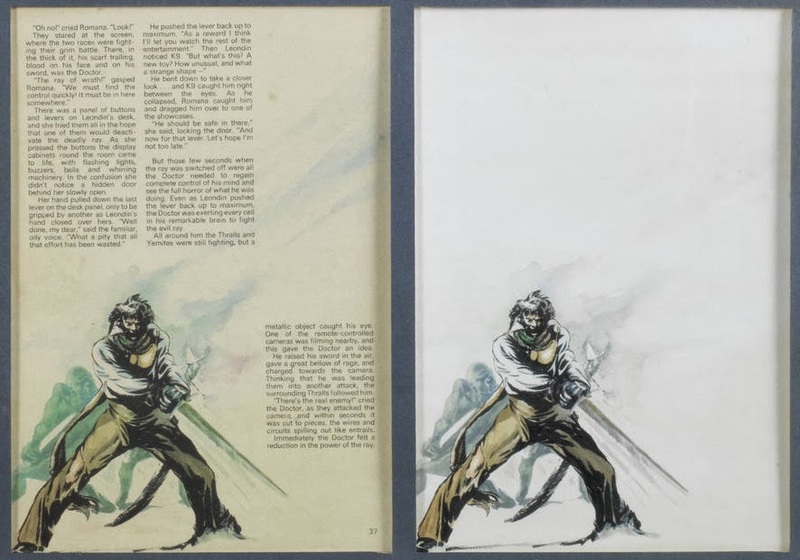 DOCTOR WHO: A PIECE OF ORIGINAL ARTWORK FOR 'THE DR. WHO ANNUAL 1977', by Paul Crompton, mixed media on board, for the story, 'The Body Snatcher', p.35, mounted and framed with a copy of the finished page, together with an original edition of the Annual, artwork 12 x 16 inches (30x40.5cm) within mount. 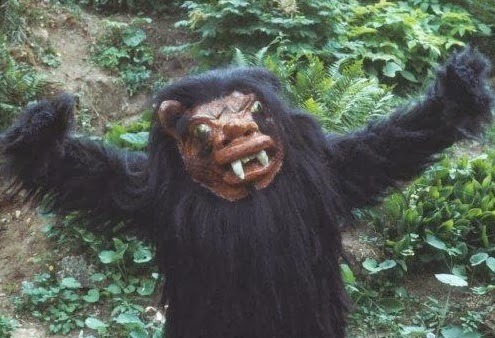 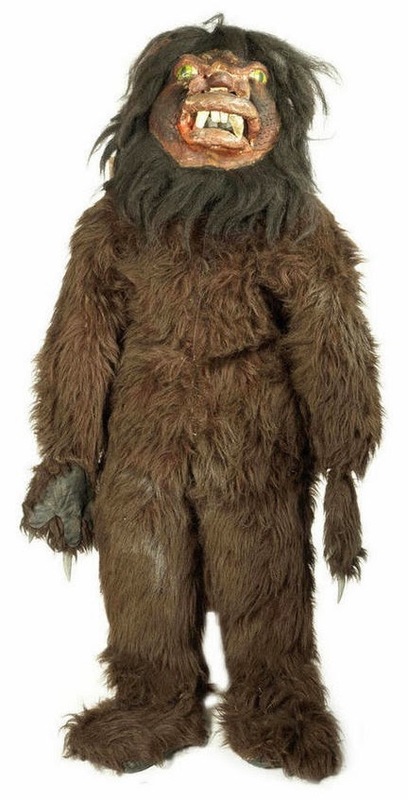 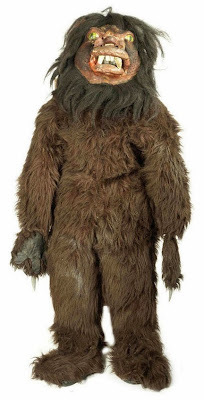 DOCTOR WHO: THE ANDROIDS OF TARA - A TARAN WOOD BEAST COSTUME, November - December 1978, comprising: a mask in the formed as scaled face, protruding eyes and teeth, of synthetic fur, papier-mache, foam, latex, plastic and polystyrene, with tieing straps, with body/ jump suit, of synthetic fur effect fabric, and foam, with detachable section to reverse, with padded hands, and attached claws, house on a wicker mannequin, together with a reproduction image featuring the piece, head width approximately 20 inches (51cm). 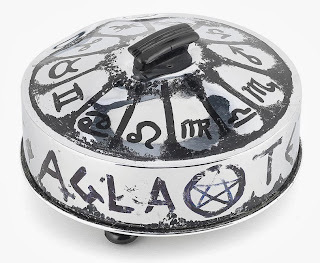 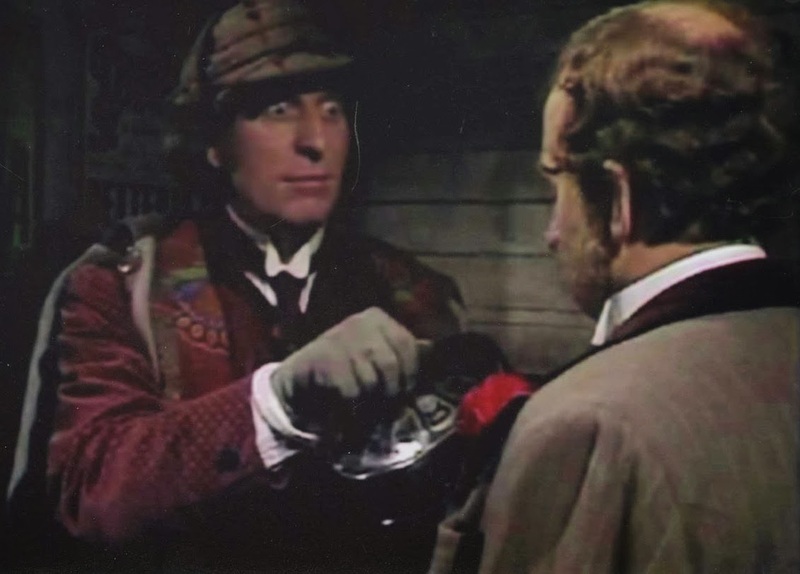 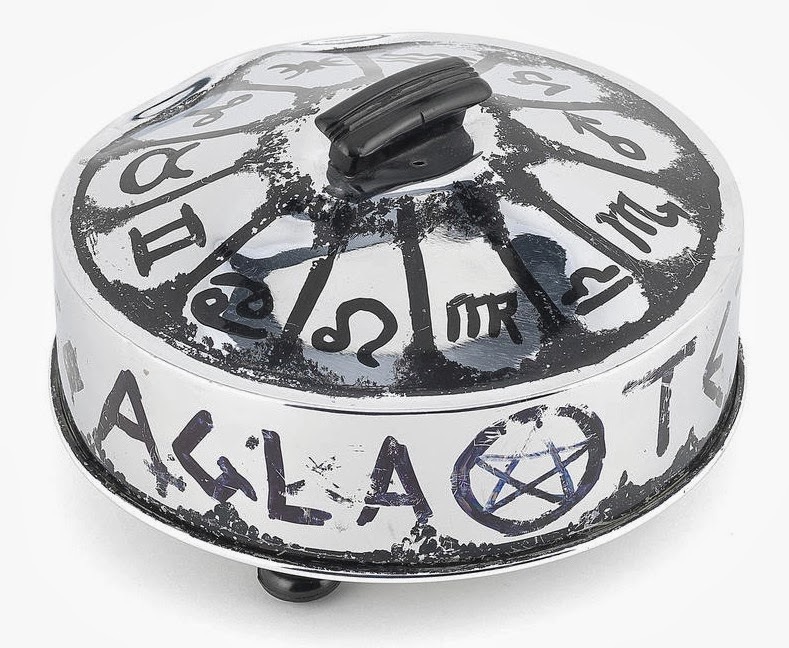 DOCTOR WHO / TOM BAKER: THE TALONS OF WENG-CHIANG - THE ORIGINAL DOVE PAN MAGIC TRICK PROP, of circular stainless steel and plastic construction, with overpainted symbols, on three plastic bun feet, together with four photographs illustrating Baker with the piece, diameter 8½ inches (22cm). 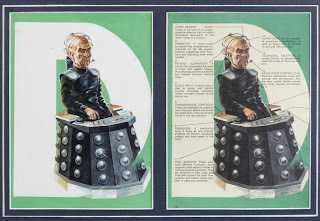 From the Estate of the Episodes magic advisor Larry Barnes. 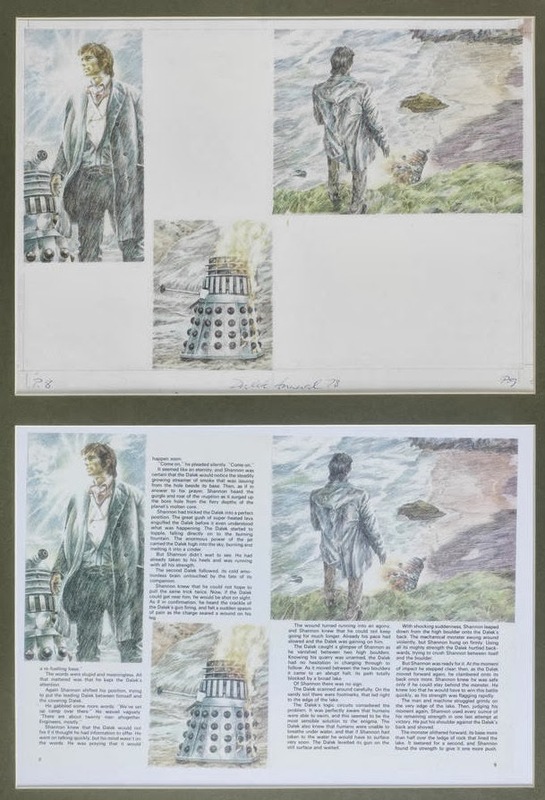 Literature: BAKER, Tom, Who On Earth Is Tom Baker?, Harper Collins, 1997, p. 209.